You've found the “U.S. Jersey Cattle Breeders” page here at Hobby Farm Wisdom! If this is the first time you have visited our site: Welcome! 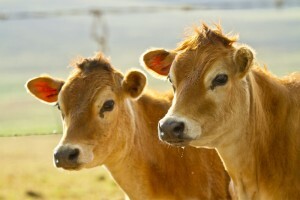 Jersey cattle, the smallest of the dairy breeds, get their name from their place of origin in the Chanel Island of Jersey. Jersey cows are known for being extremely curious and docile animals and their popularity is attributed to their small stature at approximately 900 pounds and superior milk production. They produce more milk per pound of body weight than any other breed and it has high butterfat (4.84%) and protein (3.95%) content. Jersey bulls are extremely masculine and range from 1,200 – 1,500 pounds. Ironically, the Jersey bulls have the reputation of being the most aggressive of the common cattle breeds. Jerseys can be found throughout the world due to their ability to adapt to most climates and geographical locations.